EDMONTON, Alberta (AP) - It has definitely become a Predator/prey relationship. Martin Erat got his first career hat trick as the Nashville Predators made it eight wins in a row over the Edmonton Oilers with a 5-1 victory Tuesday night. J.P. Dumont and Ville Koistinen also scored for the Predators, who won for the second time in a row and are now 2-1 to start a six-game road trip. The victory moved Nashville into seventh place in the Western Conference. "We have had a lot of success against Edmonton. 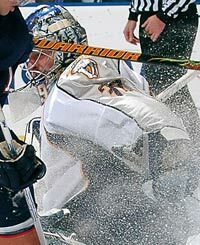 I don't know what the cause of it is," Predators goalie Dan Ellis said. "I think it just comes down to really executing when we do play them." "It's great, especially when there's only 16 games left and the points are so important for us," the 26-year-old Czech said. "But it doesn't matter who scores for us, we just need points." Nashville coach Barry Trotz was thrilled to see Erat achieve the milestone. "To watch a guy like that get a hat trick is something special," he said. "He's a special player and we rely on him for a lot of our offense. And he really contributed tonight." Tom Gilbert had the lone goal for the Oilers, who saw a pretty good run of late come to a grinding halt. The loss ended a four-game winning streak and stopped their run of consecutive victories on home ice at seven, one short of the franchise record. "In this homestand we've had a lot worse first periods and a lot better results," said Oilers coach Craig MacTavish. "We got caught on the first goal and then it looked like there was a funnel in front of our net and anything put on it was going to get funneled in. "We were guilty of being careless at times with the puck, and it seemed like every time they entered our zone they were digging it out of our net." Edmonton forward Robert Nilsson feels the Oilers were just snake-bitten all night. "They pretty much scored on their first two chances," he said. "We got a lot of good chances, but couldn't bury them. They played good when they had the puck, and when they had the chances they scored." Having lost every game in the last two years between Edmonton and Nashville, MacTavish still can't quite explain why the Predators have the Oilers' number. "It's an embarrassment to have lost eight games in a row to a team," he said. "You have to find an answer and we haven't been able to find one yet." Even the opposing coach doesn't have an answer for that. "There's certain teams, maybe it's the way we match up, our style of play, I don't know," Trotz said. "Mind you, if I did, I wouldn't tell you." The Predators came out strongly, scoring on two of their first three shots on goalie Mathieu Garon. The first goal came just 55 seconds in as Dumont unleashed a hard wrist shot from the left circle that handcuffed Garon. Under three minutes later it was 2-0. Erat put a shot on net and was rewarded as the puck banked off of defender Steve Staios and into the net. Nashville took a 3-0 lead as Erat scored his second, picking the top corner with a blast from the point. Dwayne Roloson came in to replace Garon for the second period and didn't fare much better, allowing a goal on the second shot 54 seconds in. Erat completed the natural hat trick, swatting in a rebound of Shea Weber's shot. 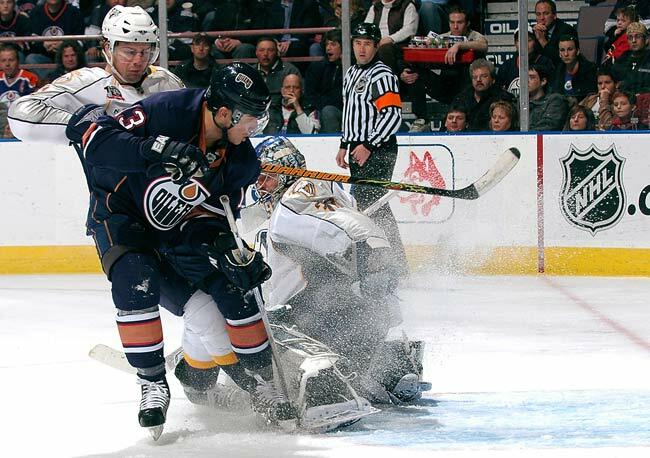 The Oilers took control of play not long after as a pair of fights erupted. Edmonton finally got a goal six minutes into the second period as Gilbert sneaked in from the point to slap his 10th of the season past Ellis, making it 4-1. The Preds restored their four-goal advantage before the midway mark as Vern Fiddler gained the zone and dropped a pass to a trailing Koistinen, whose hard shot beat Roloson. Notes: Oilers center Sam Gagner was chosen rookie of the month for February. Gagner, the youngest player in the league at 18, led all rookies in scoring with 13 points in 12 games. 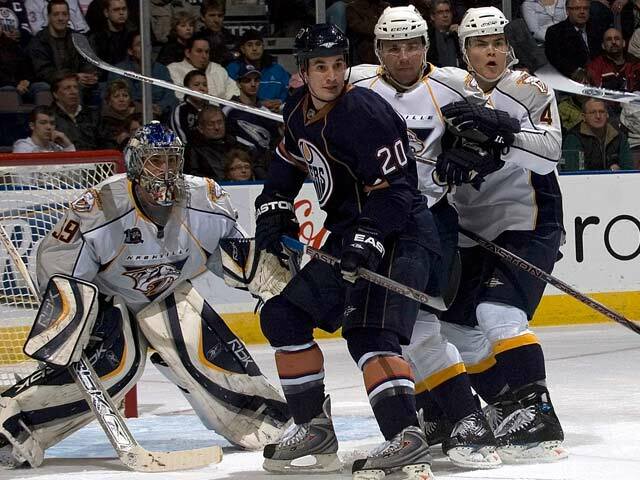 ... Nashville forward Martin Gelinas will undergo surgery Wednesday to repair his torn ACL, putting an end to his season. Gelinas suffered the injury Feb. 21 against Vancouver.